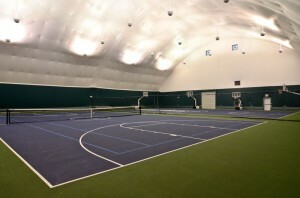 In 2001 UFS constructed the first winning touch tennis facility in Princeton, NJ. The 118’ wide x 202’ long TFS series structure was built to meet demand for indoor tennis in the central New Jersey region. After the success of their first indoor tennis facility co-owners Bill Kurtain and Steve Dansky looked to expand into the Pennsylvania Lehigh Valley with a second location in Allentown. In 2005 UFS constructed a state of the art 118’ wide x 210’ long TFS series structure. The newest facility catered to tennis enthusiasts of all levels and offered four covered indoor courts as well as two outside courts. Soon after its construction the Middle States Eastern PA District of the United States Tennis Association (USTA) selected Winning Touch Tennis of Lehigh Valley as its Tennis Club of the year. 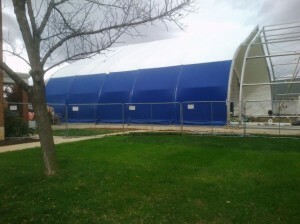 Universal Fabric Structures are designed so they can be easily relocated or expanded. As the need arises, your structure can be conveniently expanded by moving the gable end and adding more bays. In 2012, Winning Touch reached a point of growth where they needed to enclose all six available courts. “We were so happy that Universal Fabric Structures could add on to our building,” said Bill Kurtain, owner of Winning Touch Tennis. The decision was made to leave the existing gable wall up when enclosing the two new courts. Doing so would give Winning Touch a private two court area for lessons while members could play in the 4 court building without being disturbed. In addition to being the president of Winning Touch Tennis in Princeton, NJ and Allentown, PA, as well as the president of the USPTA Middle States Division, Bill Kurtain offers a specialized consulting service known as T.I.P.S. (Tennis Investment Projection Services). T.I.P.S. is a four stage consulting service designed to make the dream of building an indoor tennis club a reality. To get more information on Bill’s comprehensive, diligent and well planned process please contact him at (609) 731-0505 or email him at wttkurtain@aol.com. Visit us at IFAI Tent Expo 2013! Universal Fabric Structures along with it’s parent company Veldeman Structure Solutions will be exhibiting at the IFAI (Industrial Fabrics Association International) Tent Expo next week at the Caribe Royale Resort and Conference Center in Orlando, Florida. The expo will offer 75,000 feet of exhibiting space and spotlight some of the products and services offered by tent rental industry leaders such as Veldeman Structure Solutions. With 40 years of experience and the versatility of its product range Veldeman can offer vendors tent rental solutions for many different purposes: public or private parties, open house days, sports or cultural events, trade fairs, or exhibitions. Veldeman’s high quality products include an array of unparalleled accessories such as glass window walls and doors, cassette flooring, stair and rail systems as well as hard walls. Veldeman’s products which are also offered by UFS are in use today all over the world and have been featured at PGA tours, Breeder’s Cup Races, Grand Prix’s and multiple Olympics. Please stop by the IFAI Tent Expo 2013 between January 22nd and the 24th and pay us a visit. The UFS / Veldeman team will be located at booth 52 and we would love to help you develop solutions to your tent rental needs! 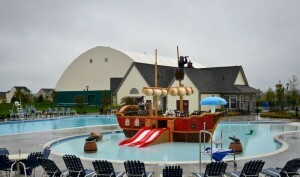 Early in 2012 Universal Fabric Structures finished construction on a sports facility for Brookfield Homes located in the picturesque town of Stephenson, VA. The Brookfield Homes Group is a land developer and residential housing builder that strives to create modern day communities. Brookfield reached out to Universal Fabric Structures to help them create the center piece of their newly developed Stephenson Village community. UFS constructed a 120′ wide X 128′ long sports facility using the Phoenix Series Structure. The building is used by the community year round for tennis, basketball and youth programs. More importantly it has given a state of the art location for the neighborhood to congregate. The steel framed structure is wrapped in a cream and green architectural PVC fabric and it seamlessly integrates with a traditional construction club house. Universal Fabric Structures offered Brookfield Homes a high quality, cost effective solution to supplying their community with a modern and custom sport facility. Please contact UFS today and let our experienced sales team help you navigate the challenges of creating a similar facility. 1-800-634-8368 or email us at sales@ufsinc.com. Be sure to check us out and like us on facebook for more pictures of this project! Hood College is an independent liberal arts college located in the historical city of Frederick, Maryland. Frederick is the third largest city in Maryland and is located approximately one hour from Washington D.C. and Baltimore. The school has close to 2,500 students in both graduate and undergraduate programs and prides itself on it’s competative athletic programs. The college has been in the process of upgrading their aquatics center and has hired Universal Fabric Structures to design and build a new cost effective structure for their pool. 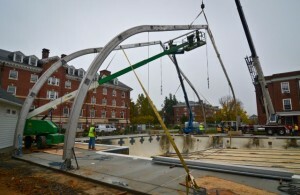 The existing pool at Hood was expanded by 2 lap lanes and the college removed the old air inflated structure it once used and UFS began raising arches in mid to late October with construction to be complete sometime by mid to late November. The structure is unique and spans from 80 feet to 90 feet in width and when completed will be 115 feet in length. Timelines are tight for the project so UFS is using it’s aluminum TFS series structure which can be raised and installed in weeks as apposed to months, like traditional construction, getting Hood’s swim team back in the pool as soon as possible. When completed Hood will have a state of the art, insulated and cost effective facility that will be used by the college swim team as well other local swim organizations. 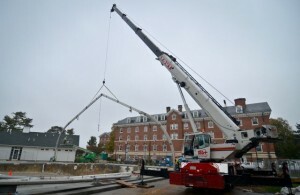 Check back to see the progress UFS makes on Hood College’s new aquatic center. You can also follow our progress on facebook. If you are interested or need information on the benefits of covering a swimming pool, diving center or an aquatic facility with a Universal Fabric Structure please contact UFS today at 800-634-8368 or by emailing us at sales@ufsinc.com. Fabric Building or Air Structure: Which Is Best? Inflate it when you need it, and deflate it when you don’t. Erect a structure in an afternoon, without the need for specialized labor. Enjoy the entire enclosed area – it is free of support poles and beams (clear span). Air structures cost a fraction of other alternatives. Are these claims true? Is an air structure really a viable and cost effective temporary solution? The trouble with bubbles: They burst. In fact, most of the claims are totally true! Air structures are a good alternative for a temporary cover that will be used, then stored, typically on a seasonal basis. They are very easy to erect, offer clear span space within, and the initial cost of an air structure is typically less than other alternatives, like a fabric structure, steel building or traditional construction. However, with each claim there’s a substantial caveat or downright disadvantage that you won’t likely discover until after you’ve already made a significant investment of money or time. For one, the air structure must be continually inflated, or it will collapse. The pumps and compressors must run non-stop, 24 hours a day, 7 days a week, 365 days a year, which can cause a significant increase in utility bills. In fact, if you plan to use your air structure year round, monthly utility bills can reach $10,000+. Three quarters of that is spent keeping the structure inflated. What’s more, in the event of a power outage, you’ll need backup generators to keep the inflation equipment running. In terms of the transitional use, air structures can be deflated and stored on a seasonal basis, but are often in need of repair from cracks in the membrane when they are re-inflated. Plus, extreme care must be taken when storing the structure, to avoid mold and mildew growth during storage. Fabric structures, on the other hand, can be installed on a temporary (seasonal) or permanent basis, require only a small generator for backup lighting (if desired or required), and don’t have the risk of not re-inflating. Furthermore, if prepared and stored properly, there is minimal risk of mold growth. As for the claim of erecting a structure in an afternoon without specialized labor, this is totally true! Only at least one member of the non-specialized labor better be well versed in setting up pumps and compressors, and have experience erecting an air structure! Otherwise, all it takes is you and 50 REALLY STRONG friends. For many fabric structures, construction from beginning to end can be completed in 2 to 3 months, and can be accomplished in what would otherwise be the off season. Erecting an Air Structure: Cheap labor, and lots of it. In terms of the usability of the interior space, air structures are designed with sidewalls which are sloped toward the center of the structure, and begin to slope almost immediately (see photo below). Picture the area in your attic that’s furthest away from the roof peak, you know, where you always hit your head. Similarly, in a bubble, the area that is in close proximity to the wall, within say 6 feet, is unusable, except for storage. A fabric structure is designed to have nearly all of the contained area be usable, thanks to the profile design of the beams that support the structure. So you don’t have to buy more structure to allow for unusable space. Finally, there’s the notion that air structures cost a fraction of other structures. And while this is true of the initial investment cost, the cost of utilities and upkeep on an air structure will eat away at that difference, and bring it equal to a fabric structure within 7 years. After that, air structure owners continue to invest 5 figures per month in utilities, where the fabric structure utility requirements consist only of lights and heat. Before making the commitment to an air structure, it is important to do your due diligence in investigating the total cost of the structure over time. If you do, you will likely find that it’s not as inexpensive as you once thought, and you’ll open your horizons to a better, longer lasting, more reliable, safe, and structurally sound alternative, that’s still a fraction of the cost of traditional brick and mortar construction. So you think want to use an air structure or sports bubble as a clearspan cover for your outdoor pool or practice field to create a seasonal or year round climate controlled environment? Before committing to an air structure, please take a few moments to learn about the advantages and disadvantages of this technology. Typical Air Structure: Example of an air structure used to cover a practice field. One of the primary reasons for choosing an air structure over a frame supported fabric structure, or even traditional construction, is the comparably lower purchase price. The range for price per square foot for air structures is narrow due to the lack of customization available. Fabric structures and traditional construction can be customized on many levels with interior and exterior finishes, lighting, fire suppression systems, and ventilation being just a few. Typically air structures are used on a seasonal basis and are inflated and deflated many times over their lives, and are used to provide a comfortable environment during the winter. The average serviceable life of an air structure is 8 to 10 years, although permanently inflated structures can last up to 20 years. Before you start dialing to find out where you can get one, there’s something you should know. Air Structures are very expensive to maintain. What’s to maintain? The short answer is that the air structure must be continually inflated using air pumps and compressors, thereby using significant electricity. Air structures are at a distinct disadvantage to both fabric structures and traditional construction when the maintenance costs and downtime expenses over the life of the structure are considered. In fact, if you plan to keep the air structure permanently inflated, in about 7 years you will have paid for a fabric structure, which requires no inflation. After that time, if you owned a fabric structure, the only utilities you’ll need are light and heat. In contrast, utility costs are high for the entire life of the air structure, and often cause the continued use to become cost prohibitive. Just a few things to consider before making that call. 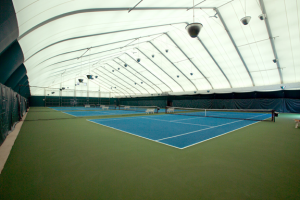 Interior View of a Fabric Structure: Photo of a fabric structure covering tennis courts. The need for a temporary building can arise for a myriad of reasons and a seemingly endless number of applications. In response to these needs, there are many sizes and shapes of temporary buildings. London 2012 Olympic Basketball Stadium: A temporary structure that will be dismantled and purposed after the games conclude. Not only is it difficult to identify a cost effective solution for such a large and short term temporary application, the process is often complicated by the need for “clear span” space. Clear span can be defined as a span or distance inside a structure that does not require the use of support beams. A support pole in the center of the local Wal-Mart is completely acceptable, but if placed the center of a football practice field or tennis court, it might raise a few eyebrows. 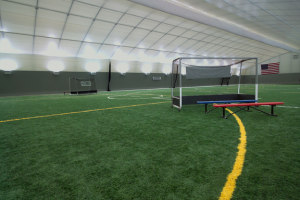 Pinelands Sports Complex: Indoor multisport field is covered using a fabric structure. This type of fabric is not something available at the local yard goods store, but rather sophisticated, engineered fabric. The specialty manufacturer typically begins with a polyester “scrim” or base fabric, and coats it with polymer compounds for durability, pleasing appearance, and maintenance free care. Because the cladding is light weight, durable, and long lasting, the underlying structural elements can span greater distances unsupported, while the engineered fabric keeps out the elements. 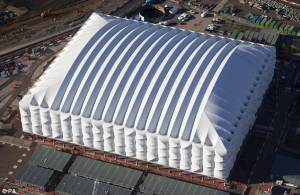 Fabric structures can reach clear span widths as wide as 300 feet, and can be made infinitely long. What’s more is that depending on the intended use, site preparation, foundation, and local building codes, the fabric cladding could go maintenance free for 5 years, and last up to 20 years before the structure would need to be recovered or “reskinned.” The frame is generally guaranteed for a minimum of 25 years, and has been known to last at least twice as long without repair. Additionally, fabric structures are generally about one quarter the cost, have a dramatically sorter lead time, and install in a fraction of the time of traditional (brick and mortar) construction. They are reusable, relocatable, fully recyclable, and can be insulated, lighted, and environmentally controlled for the comfort of the occupants. If a need for a temporary structure, seasonal cover, or large indoor open space should arise, consider the benefits of selecting a fabric structure. It could be the perfect solution that provides the shelter that’s needed in a short time frame, and at a fraction of the cost.